In 2011, on the basis of a group of companies "Azovmash" created "Azovmashinvest holding." 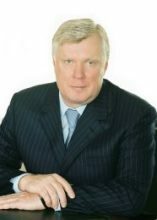 President "Azovmashinvest holding" became AV Savchuk, first vice-president - A.P.Bely. 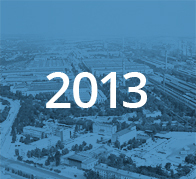 In 2011 Azovmashinvest Holding was established on the basis of Azovmash group enterprises. This Holding included PJSC Azovmash, PJSC Azovobshemash, PJSC Mariupol Heavy Machinery Plant, PJSC Mariupol Thermal Plant, PJSC Chief Specialized Designing and Technological Institute, Trading House Azovobshemash Limited, Chief Specialized Designing Bureau of Carriage Engineering Limited named after V.M. Bubnov, PJSC Poltavkhimmash, PC Azovelectrostal. The President of Azovmashinvest Holding was A.V. Savchul, the chair of vice-president was held by A.P. Belyi. Management Company Azovmashinvest Holding was founded in 2013. Office of the President was held by Taras Viktorovich Polishchuk, Aleksey Petrovich Belyi became the First Vice-President and Evgeniy Vladimirovich Kovalev became the Director General. At present Azovmashinvest Holding is known through over the world as acknowledged at international market manufacturer of metallurgical and mining equipment, lifting machines, and freight cars. Products of freight cars building stipulate the largest part in annual output. They include more than 40 types of railway tanks and container. Each year Azovmash produces new models of freight cars, such as railway tanks of high load capacity for liquefied gases and oil products, special tanks, tank-containers, box cars (for packed lightweight cargos, for perishable goods, heat-insulated cars, car carriers), open-top wagons with solid bottom and with hatch, hoppers for transportation of mineral fertilizer and grain. In recent two years enterprise developed production of long-base railway flat cars for transportation of pipes and wood, containers. refueling provisions for civilian aviation, heavy-load fuel carriers for transportation of oil products and liquefied gases, vessels and equipment for underground and above-ground storing of liquefied hydrocarbon gases. Our machines operate in all airports of the CIS, as well as in 40 countries of the world. Azovmashinvest Holding is manufacturer of powerful, on a number of occasions unique lifting machines, such as portal cranes with capacity from 32 to 160 t., gantry cranes of more than 100 t. capacity, bridge cranes with capacity from 15 to 40 t., and special cranes with capacity from 40 to 400 t.
Production of heavy machinery specializes on manufacturing of metallurgical equipment (equipment for blast furnace shops, including furnaces with capacity up to 5 thousand m³ and more; oxygen-converter complexes for steel production, including converter with capacity from 5 up to 400 t.); mining equipment: rotary complexes with hourly output ranging from 2500 to 5250 m³; conveyor complexes for placing of different rocks and ores in dumps, powerful rotary reclaimers with hourly output up to 1000 m³. Azovmashinvest Holding has tight partnership relations and supply its production in more than 20 countries of the world, including the CIS countries – Russia, Kazakhstan, Belarus, Uzbekistan, as well as far abroad countries – Brazil, Hungary, India, Serbia, Montenegro, Bosnia and Herzegovina, Pakistan, Algeria, Egypt, Turkey, Germany and others. A new stage in the development of "Azovmash" began in 2000, when under the leadership of A. Savchuk was established control structure - JSC "Azovmash", which brought together on a corporate basis of "MZTM", "Azovobschemash", "Mariupol Thermal Plant" "GSKTI", later more and «GSKBV them. VM Bubnov "
Aleksander Vladimirovich SAVCHUK (06.08.1954 – 11.11.2012) – chairman of the board, then the President of OJSC Azovmash in 2000 – 2012, Member of Parliament of Ukraine (2006 – 2012), Professor, Doctor of Economics, holder of Order of Merit, Honoured Machine Builder of Ukraine, Honourable citizen of Mariupol. He had been worked at the plant since 1986: deputy shop manager, manager of shop No. 27. In 1991 when Azovmash was reorganized to concern he became leader of governmental company Azovobshemash that later was transformed in OJSC. In December 1999 A.V. Savchul was elected as chairman of the board of OJSC Azov (now OJSC MHMP). In a short enterprise under his direction succeed in getting over the difficulties and returned itself status of leader in domestic heavy machinery. Past glory of the company started to return. Powerful electric furnace complex was created on the basis of electric furnace shop. Now it is called Private Company Azovelectrostal. It supplies Azovmash enterprises with large, middle and small casts. In 2000 Azovobshemash produced the first in Ukraine armored personal carrier. In 2001 Azovmash once again became leader of heavy machinery in Ukraine. The enterprise is carrying out development and commissioning of new products types. Azovmash assortment was extended with box cars with thermo-insulation, lidman open-top wagons, hopper cars for transportation of coke, grain, mineral fertilizers, scale-cars, transfer cars, car dumpers, and railway flat cars. This equipment was designed by Scientific and Technical complex of PC Azovelectrostal and Chief Specialized Designing Bureau of Carriage Engineering Limited named after Valeriy Michaylovish Bubnov. Over the years of its existence Azovmash creates more than 50 models of freight cars for transportation of more than 500 types of cargo. Azovmash is active participant of international space project “Cyclone-4”, within the frameworks of which it develops and produces equipment for spaceport Alkantara (Brazil). When in 2006 A.V. Savchuk was elected to the Parliament of Ukraine, position of chairman of board was taken by V.I. Telytsia and since 2009 by I.N. Karapeychik. Since 2011 Igor Nikolaevich Karapeychik has held office of the Director General of PJSC Azovmash. 1989 due to returning to the city its historical name Mariupol PA Zhdanovtyazhmash was renamed to Azovmash. In 1990-s Azovmash went through very difficult period, when the plant lost defence orders after the USSR collapse all economic and production connections were broken. In 1991 production association Azovmash under the direction of A.E. Antifeev was transformed to concern with 14 legal entities (later its number increased to 20). The concern had several structural changes, as a result four main joint-stock companies were founded, such as Azov (now Mariupol Heavy Machinery Plant), Azovobshemash, Chief Specialized Designing and Technological Institute, Thermal Plant. In conditions of economic crisis the enterprise struggled to remain alive. 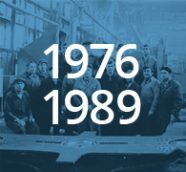 In 1990-s Azovmash built 17 lifting cranes for companies and ports of Ukraine and Russia, developed manufacture of autoclaves and grab loaders, continued production of fuellers. These years Azovmash was the first at the territory of the CIS to create production of tank containers. The plant started to produce consumer goods on conversion scheme, including gas and electric cookers (in 1992 the plant was the first in Ukraine to develop production of Ukrainian electric cookers), water heaters, teflon dishes, etc. However, situation remained critical. In 1998 – 1999 OJSC Azov (where main facilities of Azovmash were concentrated) twice was on the verge of bankruptcy. New stage in development of Azovmash began in 2000, when under direction of A.V. Savchuk, OJSC Azovmash was created as management company. OJSC Azovmash on corporative basis united OJSC Mariupol Heavy Machinery Plant, Azovobshemash, Mariupol Thermal Plant, Chief Specialized Designing and Technological Institute, later Chief Specialized Designing Bureau of Carriage Engineering Limited. In 1976 ZHMP, which had net of designing departments, laboratories, multisectoral production, received status of production association and was called PA Zhdanovtyazhmash. In 1980 Igor Nagaevskiy became its director. To that time Zhdanovtyazhmash was considered as one of the leading machine building enterprises of the USSR with production of wagon building, heavy machinery, general machine building (special production) and consumer's goods. Products of machine building (tanks, open-top wagons, oxygen converters, steel casting ladles, metallurgical technological equipment, lifting cranes, mining equipment, etc.) were supplied to 24 countries. In 1980-s PA Zhdanovtyazhmash became main supplier of rotary complexes for mining by open-cast methods. Rotary excavators ЭРП-2500, ЭРШРД-5250 with hourly output of 2500 and 5250 m³, loaders and other mining machines successfully operated in different geographic conditions, including Central Asia, Far East, North and Siberia. Operating as main manufacturer of peace technologies PA Zhdanovtyazhmash continued its work in defence sphere. It took part almost in all important governmental programmes and developed unique machines in its shops. 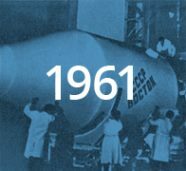 In 1960 – 1970-s the plant took part in creation of rocket “Sheet Rodiny” (Motherhood Shield). In 1980-s it manufactured fuelling systems for space complex “Energia – Buran”. The plant worked to create mine underground installations for ballistic missiles launch, as well as special wagons for Military Railroad Missile Complex. The association did not stop production of armor steel, armoured cases and towers, tank units for tanks of different types, such as T-54, Т-62, Т-72, Т-80, Т-80, Т-84-УД. In 1969 the plant started designing and production of hosting cranes. In 1970 two first portal and gantry cranes were delivered to clients. During the following four years ZHMP designers developed 14 types of gantry cranes. 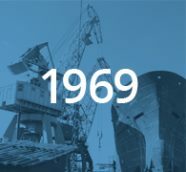 In 1975 – 1976 ZHMP supplied two dock gantry cranes GP-480 to shipyard in Romanian port Constanta. This type of crane did not have any analogue in the world. The high of load lifting stipulated 66 meters, and span between supports was 115 meters. In 1977 crane stood after strong earthquake without any damages. At the beginning of 1970-s ZHMP manufactured the world biggest railway 8-axial tank of 120 t. capacity. Labour feat of ZHMP specialists was rewarded by Motherland. In 1971 the plant awarded with Lenin Order, in 1976 the Order of the October revolution appeared on plant banner. In 1976 Poland government awarded ZHMP staff with Komandorskiy Order of Merit with Star for equipping of converter shop in Katowice. At the time of soviet period five ZHMP specialists became Heroes of Socialist Labour, they were Petr Vasilyev, foreman of open-hearth shop (1958), Anatoliy Kozel, turner-borer of heat-treatment shop No.1 (1969), Grigoriy Zuev, turner of MSB-1, Vladimir Karpov, director of the plant (1971), Alexey Shehovcev, turner of shop No. 15 (1976). A lot of enterprise workers received state awards of the USSR and Ukrainian SSR. By 1962 ZhZTM was designed for 58 items of new machines and equipment. In 1962 ZhZTM produced the world's largest steel ladle SADC 480 tons. To 1962 Zhdanovsk Heavy Machinery Plant designed 58 items of new machines and equipment. 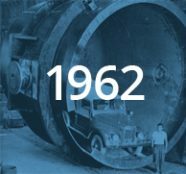 In 1962 ZHMP produced the world biggest steel casting ladle of 480 t. capacity. At the beginning of 1962 the Decree of Central Committee of the Communist Party of the Soviet Union and the USSR Cabinet determined ZHMP as chief (and single) enterprise in production of oxygen converters for steel and metal works of the state (100% of soviet converter steel were melted in ZHMP converters). In 1963 Ilyich plant built converter shop equipped with ZHMP converters. These results were achieved thanks to hard work of our remarkable specialists: designers, engineers, technicians, workers. Chief Designers of ZHMP were V.M. Manov, A.V. Efimov, V.G. Kononov, V.A. Mikheev, L.P. Malyshev, Y.N. Dzumov-Grek, F.G. Matyash, F.V. Krayzinger, V.D. Sablin, P.E. Praga. Significant contribution to development of the plant was also made by A.F. Dovzhenko, the Chief Designer. Workers with high level of qualification have been worked at shops. In 1967 the first all-USSR contest of young machine operators was held in the USSR. Several hundreds of best metal turners, millers, etc. arrived to Moscow. In the result of contest Vasiliy Dudarev, ZHMP metal turner, became the best turner and owner of Crystal cutter, and Vladimir Vovk from ZHMP obtained title of the best turner of the state at the all-USSR contest in 1968. 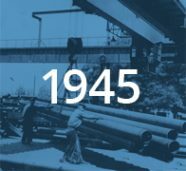 In October 1961, headed ZhZTM VF Karpov, an ardent advocate of further development of the company, creating a plant-based heavy engineering industry. Vladimir Fedodrovich KARPOV (04.11.1911 – 23.09.1987) – the Director of ZHMP (1961-1976), Director General of Zhdanovtyazhmach (1976-1980), Hero of Socialist Labour (1971), Laureate of the State awards of the USSR (1951) and Ukrainian SSR (1978), Honoured Machine Builder of Ukrainian SSR (1980), Honourable Worker of the Ministry of heavy and transport machine building of the USSR, Deputy of the Supreme Soviet of Ukrainian SSR of VI-IХ convocations, holder of orders of Lenin, Red Star, the Great Patriotic War of the 1st and the 2nd levels, three orders of Labour Red Banner, Komandorskiy Order of Merit, medals, Honorary Citizen of Mariupol (1987). Decree number 325 Council of Ministers of the USSR from March 26, 1958 and the order number 314-P Stalin Economic Council of 28 April 1958 as the shops on May 1, 1958 Plant. Ilyich shared. Thereby, on May 1st, 1958 Ilyich plant was divided according to the Directive No. 325 of the Council of Ministers of the USSR as of 26.09.1958 and the Order No. 314-R of the Stalin Economic Council as of 28.04.1958. On the basis of machine building shops Zhdanovsk Heavy Machinery Plant (ZHMP) was created (in 1958 Mariupol was renamed in Zhdanovsk). It included productive area “B”, former plant Russkiy Providans, armor production and manufacturing of fuellers. N. A. Bulygin, the secretary of Ilyich plant party committee, became the first director of new plant. In 1989 he was replaced by E.V. Mazur. In 1960 E.V. Mazur started general reconstruction of the plant, which allowed its employees carrying out of the most difficult tasks. New designing departments and production facilities were created, assortment of products were expanded. In 1960 Zhdanovsk Heavy Machinery Plant started production of open-mine bucket excavators. New plant took active part in defence and space programmes of the Soviet Union. Its fuel-supply complexes filled all soviet space rockets and vehicles. Flight of Yuri Gagarin on April 12th, 1961 took place with participation of our specialists. A lot of them received government awards. In 1961 E.V. Mazur was assigned to a job in Ukrainian Economic Council. Subsequently he became Deputy Minister of General Machinery. 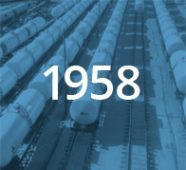 March 11, 1945 the State Committee of Defense of the USSR decided to organize a factory production Ilyich tank wagons for the carriage of oil and gasoline. From this moment begins the story tsisternostroeniya not only in our city , but also in general in the USSR. The challenge was not only to build new shops and translate the work of many acting workshops on new products , but also in the fact that in the country such products are not produced , and it was necessary to develop its technology . A department in the factory tsisternostroeniya of 12 people . It was headed by Peter M. Hodos . Deputy Division Chief was Leonid S. Sigin . Both are awarded State ( Stalin) Prize . In the short term workshop was organized and tsisternostroeniya . From year to year the number and range of manufactured tanks grew their capacity. The factory started to produce and other machinery : agricultural machinery, metallurgical equipment , slag , chugunovozy . Since 1947, the country's first plant mastered the production of tankers for rocketry , from this period dates back to the PAO " Azovobschemash ." By 1958, the production of mechanical engineering at the metallurgical plant was already half of the gross production. 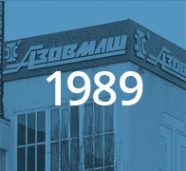 History of individual shops PAO "Azovmash" is rooted in the end of XIX century, when in Mariupol in 1899 not far from the factory Nikopol-Mariupol Mining and Metallurgical Company was built another metallurgical plant - "Russian Providans." History of separate shops of Azovmash PJSC takes its beginning in the end of XIX century. 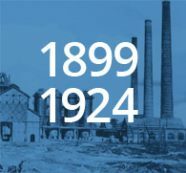 In 1899 Russkiy Providans, steel and metal works, was built near the plant Nikopol – Mariupol mining and metallurgical community. Russkiy Providanc specialized on production of cast iron, steel, and rolled metal, particularly rails. In 1918 both metallurgical plants were nationalized and in 1920 they were incorporated in company named Mariupol state metallurgical plants “A” and “B”. In 1924 after Vladimir Lenin death this plant received name Ilyich at the instance of its workers. In 1930-s at the top-secret laboratory for welding of armored steel grades was organized at areas of “B”. At this place famous Mariupol cast armor was born, from which towers and armor units of legendary tank T-34, as well as other soviet tanks were casted.